Even if your pet got the best care ever, you may face the flea problem one day. Actually, animals can be infected with fleas anywhere and anytime. Once fleas get on your pet’s body, the start feeding on their blood, laying eggs and multiply very quickly. This flea medicine review allows you choosing the means that offers you a safe and effective solving of problem with blood-sucking parasites best than any other medicines. To understand at what moment you should use a flea medicine, you need to determine how your animal got infected and the life cycle of these parasites. The life cycle of fleas depends on few factors, for instance, humidity of the environment, temperature and food. You should know that only adult fleas live on pet’s body, eggs and larvae grow up in cool and dark places, like cracks and folds in soft furniture and under carpets. Fleas are small, flat, wingless parasites that are hard to see with the naked eye. If you have doubts, put your pet on a white surface and brush its hair. You will see some fallout of blood remnants and flea feces. If you wet them with water and see some brownish spots, then your pet is definitely infected with fleas and you can start the treatment. Watch over your pet’s behavior. 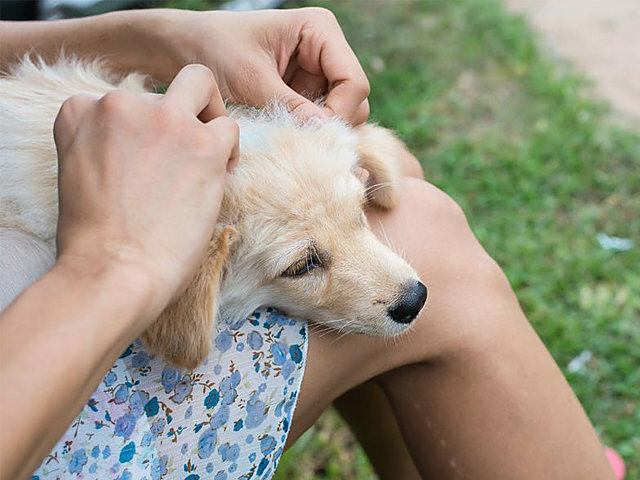 When fleas bite, your little friend is agitated all the time, scratching the fur and becoming inattentive. The bite marks become wounds that can be infected easily. Timely use of effective flea medicine will reduce the risk of different infectious diseases. Some flea medicines are designed to control fleas, others to kill flea larvae, and the third ones to prevent flea infection. To choose the right medicine to fight against dog fleas, you need to learn carefully the leaflet instruction that comes inside the medicine package. The most popular flea medicines for dogs are Cythioate-containing drugs. You can buy Cythioate flea medicine in the form of pills or oral liquid. This kind of medicine is contraindicated for pregnant dogs or greyhounds. Cythioate pills dosage is 30mg. One Cythioate pill is suitable for dogs weighing 20 kg. The recommended dose regimen – every third day, or twice a week. Two milliliters of oral liquid contains 30 mg of Cythioate. The dose regimen is the same as for the pills. Another well-known flea medicine for dogs is called Fenthion. Pharmaceutical form of Fenthion – liquid (single-dose applicators). The medicine is intended to fight against external parasites in dogs over 10 weeks old. Take 4 to 8 mg of Fenthion solution per 1 kg of pet’s bodyweight. The frequency use of this flea medicine depends on the severity of flea infection. The maximum frequency use must never exceed 2 times a week. You can buy Cythioate or Fenthion flea medicine for dogs under such brand names as Proban and Pro-Spot Solution by Bayer HealthCare in the USA. You can also order Proban oral liquid by the largest manufacturer of medicines and vaccines – Zoetis. In the USA, you can find some more flea medicines, approved by the national health regulating authorities. Such medications usually contain such active ingredients as Spinosad Milbemycin Oxime and (S) – methoprene. You can buy flea-control medicine produced by Wellmark International and Lilly Corporate Center. Most cats have lighter body weight than dogs and thus they need much more precise dosing of flea medicine. Many manufacturers produce their medications in the form of solutions, which helps to vary the doses. Program Suspension flea medicine comes in individual dose pack and is suitable for cats over 6 weeks old. Each individual dose pack contains 135 or 270 milligrams of Lufenuron. Small sachets of Program Suspension are designed for cats, weighing under 10 lbs. The larger sachets are for oral use by cats weighing 11 to 20 lbs. In case your pet weighs more than 20 pounds, combine the sachets according the above recommendations. Pharmacies offer to buy Lufenuron flea medicine for cats by Novartis Animal Health. This pharmaceutical company supply Lufenuron in both the liquid (suspension) and chewable tablets. The dosage and recommendations for use of tablets are the same as for the liquid. Advantage Multi is quite a new flea medicine. This medication for blood-sucking parasites suits cats and ferrets. The benefit of this flea medicine is that it can be used just once a month. Advantage Multi is supplied in the form of solution. Each milliliter of this solution contains 10mg of Moxidectin and 100mg of Imidacloprid. You can use Advantage Multi not only to kill fleas, but also to prevent the infection with dirofilaria immitis and intestinal roundworms. Most of the popular flea medicines are meant for both cats and dogs. If you own more than one pet all of different kind, then such medicines are best for treatment of infection with blood-sucking parasites. One of the best flea medicines for dogs and cats is Revolution. This medicine kills adult fleas and prevents the development of flea eggs within 30 days. In addition, Revolution can be used to prevent the infection with other parasites (for example, mites). You can buy Revolution flea-control products for cats and dogs by Zoetis in the USA. Please pay attention to the fact that only dogs over 6 weeks old and cats over 8 weeks old can take Revolution. The recommended dose of flea medicine is 2.7 mg of Selamectin per 1 pound of bodyweight. Flea preventive measures must include a regular vacuuming of the entire house. Walk your pet in the clean areas with short cut grass. Please note that some kinds of flea medicines are suitable for dogs only and can be toxic for cats or other pets. If one of the types of flea medicine does not work, causes side effects or some allergic reactions, try to use other product. Online pharmacies offer to buy many different flea medicines. Price of flea-control products may depend on the pricing strategy of the manufacturer and online pharmacy.